Just returned from 2 weeks at Ambar beach with two children 4 & 8. Guests were made up of 70% Germans, 25% Spanish, 5% british. Didn't have to get up at crack of dawn to put towels down on sunbeds & we always blame the germans. 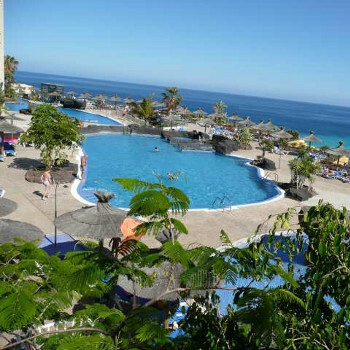 Plenty of sunbeds situated around 3 pools with shade if needed. Pools were very clean but not heated. Childs pool next to playground with two small waterslides. Outdoor spa.heated in door pool, jacuzzi, steam room & sauna. Gym fitness room with 5 -6 classes daily. Squash courts all free. pool tables. We had a suite which was very spacious. Fridge 2 TVs (10e deposit for hire of remote control). 2 patios, clothes airer & pation furniture. You can hire a sunbed for your patio for a small charge. Hairdryer not very good, would suggest taking own. Stand alone shower & seperate bath. Towels changed 4 times per week, bedlinen twice. Plenty hanging space & drawers in double mirrored wardrobe. Safety deposit box 2 e per day, big enough for lap top. Self service restaurant, breakfast good choice:- toast, ceral, croissants, pancakes, eggs, beans ham cheese fruit. Lunch & dinner - OK. Definately not 4 *, variety poor, usually chips, pasta 2 x fish 1 x meat & salad bar.Like most AI repetative. However no one got an upset stomach, which we usually do get since having salmonella at a 4* previoulsy. No seperate childrens menu.Self service drinks in restaurant including wines & beer. Tapas restaurant needs to be bboked at reception. Didn't see the point as it was not tapas, apart from the spanish omlette, everything else was available in the restaurant at some stage. If booked for earlier sitting, only allowed 1 hr. Saloon bar self service for beer & spirits & soft drinks. Queue for spirits. daily entertainment - good activities for Adults - base arounf the body beautiful/fitness fanatic germans. Last week introduced around the pool fun noon games, no hassle to join in. All activites alternated to keep interest. No childrens activities although can hire board games. Evening entertainment improving. Obvioulsy listening to guests comments. Disco nights were good with dressing up gear supplied. Magic show good. Parrot sho waited until 10-15 then was on stage for 10 mins. As soon as it finished they took pictures of guests with parrots for 10e upfront. Very couple orientated hotel. Has only been open to British for 6 months, however they are listening. i do believe this has the potential to be a good hotel as long as the british dont spoil it. As very few of us, we did tend to stick together and that is what made it a good holiday. Transfer Time: 1hr as there was no drop of at any other hotels on route to Amber Beach.